A few months ago, The Root began a series of stories under the name “I Tried It,” chronicling the experiences of writers who were willing to step outside their comfort zones to try things they normally wouldn’t consider. Some were incredibly adventurous, like senior reporter Terrell Jermaine Starr’s visit to one of the most radioactive places on earth, Chernobyl. Some were boundary-expanding, one-time occurrences, like News Fellow Anne Branigin’s night at the opera. Many of them were the result of bullying and peer pressure, like when the staff discovered that News Editor Breanna Edwards had never seen the movie Purple Rain, or when the staff discovered that I had never tasted bacon. Because I am willing to walk a mile in anyone’s shoes, or because I’m stupid, this week I will become a Donald Trump-supporting, Fox News-consuming Republican. Although I can’t change what’s in my heart (which contains mostly remnants of Krispy Kreme doughnuts, reverse racism and fantasies of opening a heart-shaped-flower tea shop and lotion boutique in Wakanda), I am approaching my time as a consumer of all things Republican with an open mind. As someone who closely follows politics and sports, 75 percent of my television consumption is MSNBC and ESPN. This week I will still enjoy my daily fix of sports and other entertainment, but my news consumption will be restricted to conservative media outlets. My transformation began Monday night with an hour of programming on Fox News. I watched the end of Tucker Carlson’s show as the sentient piece of iceberg lettuce guffawed about liberals’ angst over gun control, because dead kids are always hilarious. I was able to stomach 20 minutes of Sean Hannity’s performance-enhanced head before I threw up outside my mouth. (His noggin is obviously on steroids. No one’s head can grow to the size of an award-winning watermelon without HGH or the stuff they feed the Tyrannosaurus rex in Jurassic Park.) I soon began to realize a very important fact. He’s actually using facts. Obama did know about the plot to tamper with votes before it was made public, and Clinton did pay for the Christopher Steele dossier. Of course, Hannity leaves out the facts that the dossier was initially funded by Trump’s Republican opponents and that the Obama administration didn’t know about the hacking until late in the election cycle, and enacted sanctions against Russia when it discovered the malfeasance. But, you know ... facts, shmacts. The point is, there are legitimate questions that could be raised about the Obama administration’s handling of the incident, but Hannity and his cohorts use the omission of relevant information to propagate the narrative that Trump is the subject of a Democratic witch hunt at the hands of the FBI, and now I’m screaming at the television because I know there are millions of people watching this who believe it to be the truth. And for the first time, I begin to understand that there are many Trump supporters who are not tobacco-chewing redneck idiots; they are victims of propagandists fueling their confirmation bias. 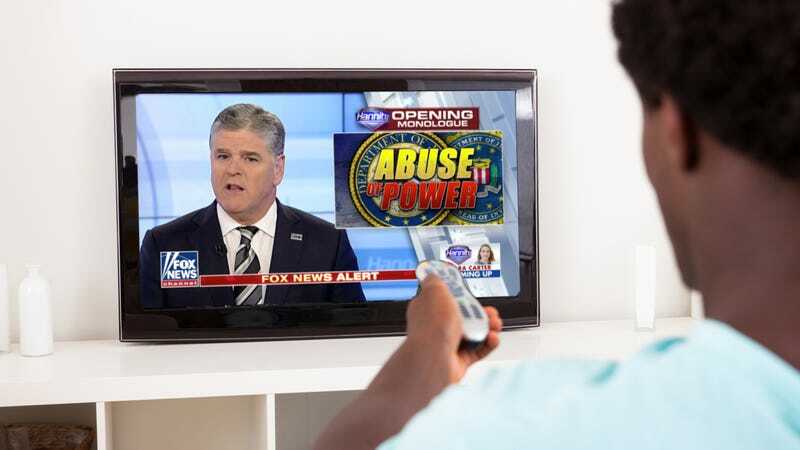 Hannity is as good at what he does as any shady storefront preacher, and I can imagine the people caught in the gravitational pull of his oversized head screaming “Hallelujah” at his version of the truth, the whole truth and nothing but the truth. It is a learning experience, and I promise to share every bit of it. If, by the end of the week, you hear news about a certain The Root writer wandering in circles at a Trump rally, muttering Republican talking points and wearing a “Make America Great Again” hat, you’ll know I didn’t make it. I could use your thoughts and prayers. And liquor. Lots of liquor.